White northern beans are light-colored beans with a hard outer shell. Cooks often use them as an ingredient in white chili and soups. Like pinto and black beans, white northern beans are high in minerals, fiber and protein. Values listed are for one cup of cooked northern beans, boiled without salt. One cup of white northern beans, also called great northern beans, contains 209 calories, approximately 67 of which come from carbohydrates. One cup contains 37.3 g of carbohydrates, including 12.4 g of fiber. This is more than 40 percent of the recommended dietary allowance of fiber for most adults. Most adults need about 28 g of fiber, but athletes on higher-calorie diets may need more fiber, since the recommended amount per day is 14 g per 1,000 calories consumed. An additional 30 percent of the calories in white northern beans come from protein. One cup of cooked beans contains 14.7 g of protein, which provides approximately 32 percent of the RDA for women and 26 percent for men. White northern beans are an excellent source of protein for vegetarians, who often have trouble getting enough of this nutrient. Like all beans, white northern beans are low in fat. One cup contains only .8 g of fat, which provides less than 5 percent of the calories. White northern beans also contain no cholesterol. White northern beans may help lower cholesterol because they contain soluble fiber, which helps reduce LDL, or bad, cholesterol levels. Most beans are high in minerals, and white northern beans are no exception. 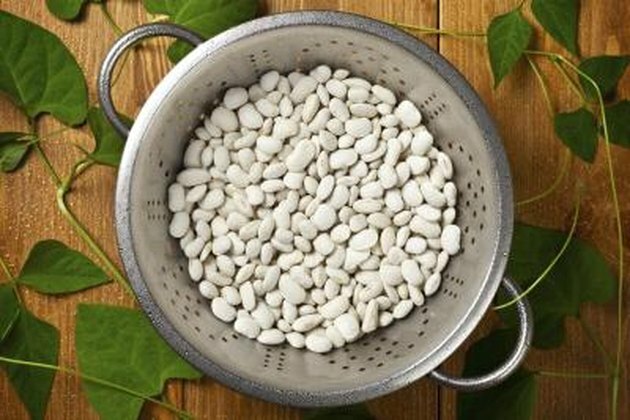 One cup of white northern beans contains more than 10 percent of nearly every macromineral -- those minerals that your body needs in larger amounts. The body needs trace minerals in smaller amounts. One cup of beans provides 12 percent of the RDA of calcium, 21 percent of magnesium, 42 percent of phosphorus and 35 percent of potassium. One macromineral not present in large amounts in great northern beans is sodium. One cup contains only 4 mg, which is less than 1 percent of the maximum recommended amount per day. White northern beans are also high in numerous trace minerals. One cup contains more than 40 percent of the RDA of copper and manganese, as well as more than 20 percent of iron. White northern beans contain large amounts of numerous B vitamins. One cup provides 16 percent of the RDA of B-6, 23 percent of thiamin and 45 percent of folate. Folate is helps your body form new cells so it is particularly important for pregnant women and infants. White northern beans are not high in vitamin C or any fat-soluble vitamin.